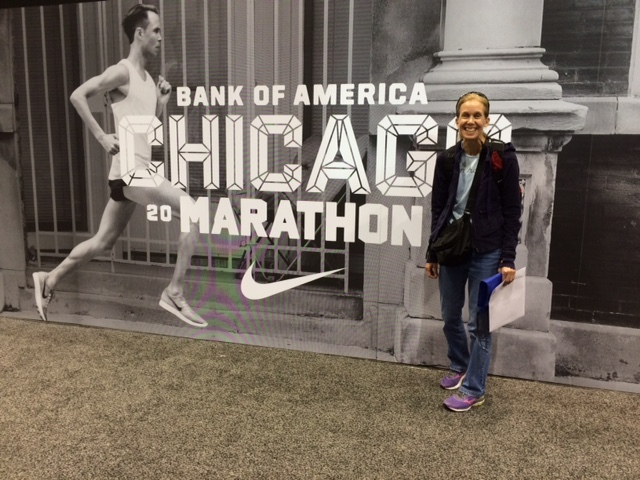 Two weeks later, I am finally ready to write about the Chicago Marathon. It was not my best race and it has taken me some time to accept that. But, without a doubt, it is the best marathon course that I have run. Even when my legs were tightening and I watched my pace get slower and slower, I kept thinking about how much I want to return next year. For me, I had two goals in Chicago: getting to the starting line and, then, crossing the finish line. I didn’t have a time goal; I had a hope but nothing tangible. Getting to the start line was my way of challenging myself over the summer to get back into running shape, and I did. I felt stronger and healthier than I had in years. With my running history of not racing well at crowded events (I dnf’d in Boston in 2012, the year of the heat wave, and I had trouble coping with the crowds at the Scotiabank Half in 2013 but managed to run a 1:34 PB. ), I wanted to test my mental toughness – to prove to myself that I am capable of running a big event and not dnf. For that reason, I trained to cover the distance. I was going to finish – no matter what. On Friday after school, Dave, the dudes and I began what became 9 hours of driving (including a long wait at the border) to Chicago. We bunked down for night in Jackson, Illinois, which kept us (well, me specifically) from getting too cramped from the long drive. 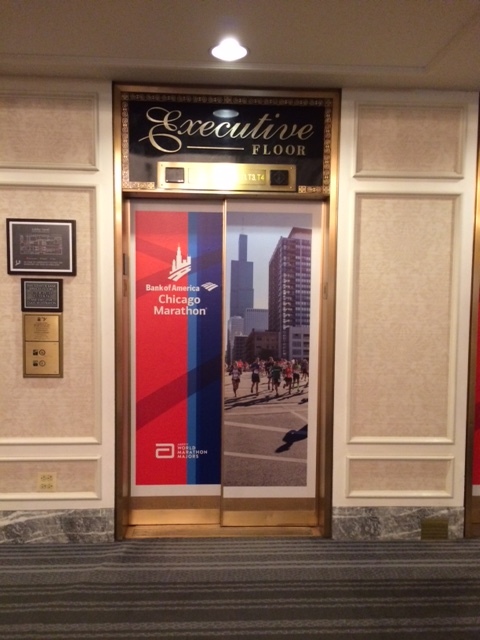 The next day, we arrived at the Chicago Hilton, the official marathon hotel, at 1:30. I would have loved to have had a nap and an easy run but I had to pick up my race kit. So the two dudes caught the shuttle bus to the expo, did our part to stimulate the American economy and got back to our hotel by 5:30. By then, my headache – unusual for me- and feelings of nausea had started. The stress of travelling and dragging the boys to the expo had obviously caught up with me. I hoped that the nausea was just unnoticed hunger and a good meal would be the cure. While the dudes and I were at the expo, Dave, who had wanted to go out for dinner, screened the downtown core for potential restaurants but I suggested eating at the hotel. “Why not?” I asked. “Everyone staying here is involved in the marathon tomorrow so all of the dining areas are offering pasta specials. And it is probably going to end up costing us just as much as going out somewhere, we don’t have the hassle of leaving, and there is no stress from looking for the right place and waiting for a table.” It was the best decision of the day. Dave and I had the pasta buffet (He supported me by eating pre-spectating carbs) and the boys ate burgers and fries. Dinner did cure my nausea so I think I was just hungry, but my head was still pounding. I took the boys to the pool and watched them splash and giggle. An hour later, we headed back to our room. It was close to 9:30 and I had just enough time to get my gear organized before hitting the pillow. By 10:00, I had taken 2 Tylenol, crawled into bed and feel asleep instantly. In less than 12 hours, I would be around Mile 16.